After a few miles, he stopped at a bar, a big wooden barn of a place, lots of cars and motorcycles in the parking lot. THE DOUBLE R RANCH. Julianna circled the block twice, to give Crowley time, and then parked. She waited. She wanted to go inside and sit invisibly in a dark corner and observe Crowley… She waited until the next group of people entered the bar, three bearded biker dudes and a woman too old for the tight leather miniskirt she was wearing. Julianna slipped in behind them. Inside, the place was dim and crowded and the smoke hung heavy, struggling to rise all the way to the wooden rafters. Music pounded: Led Zeppelin, maybe? Julianna looked for Crowley. He was sitting at the end of the bar. Not watching the mirror behind the bar but instead the shot glass in front of him. He turned it, lifted it, tipped back his head, let the booze roll down his throat. Not rushing anything, a committed drinker. The woman that Crowley was talking to had moved over onto the empty barstool between them. She had one thick brown braid that fell almost to her waist and wore a denim vest, nothing on beneath it. commentary: Sometimes the stars just align. In the same week, Bernadette at Reactions to Reading and Col at Col’s Criminal Library both recommended this author, so I chose this book and bought it. And I am properly grateful to them both, because I LOVED it – it’s one of the best books I’ve read this year. It has an intricate plot – two crimes in the past, and who-knows-what going on in the present – and two leading characters whose alternating chapters bring joy in every sentence. Wyatt, a PI, accepts a job because he doesn’t realize till too late that it will take him back to Oklahoma City, where he grew up, and where he was a survivor of a horrible murder. Julianna lives in the city, and has never got over the disappearance of her older sister. Both of them are moving round the area, looking for something, trying to find what’s going on, locked in memories of the crimes that touched them, crimes they have never recovered from. But both are just great characters, delightful, lovable and funny. I’ve already got hold of another book by Berney, published before this one, but I am so hoping he might be going to do a followup to this one, with more about these people, and about Candace and Haskell and Lyle Finn. I am amazed at Berney’s ability to write terrific women: Julianna and Genevieve are perfectly drawn, totally believable, real people with a great relationship. Wyatt saw the robber check out Karlene as she passed, his eye on her. Just one eye— the rubber pirate mask had a rubber eye patch. It was a terrible mask for a robbery. Who wore a one-eyed mask to a robbery? The movie theater operated under a special lease— it was a sovereign tenant, the self-important term Mr. Bingham liked to use. The Vatican City of the Pheasant Run Mall. The crimes in the book are serious and not underplayed, the action and investigation are excellent, very well done. But it seems also that Berney is an old softie, with his ability to see the good in almost everyone, and his basic kindly view of a difficult world. This was a five-star read, highly recommended. 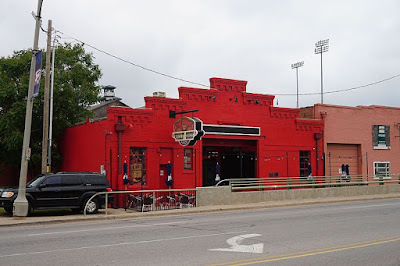 The red building is a bar in Oklahoma City. Biker girl in a denim vest is Miley Cyrus. I've heard about this one, too, Moira, and am so glad you enjoyed it. I do like those past/present connections, and the writing style is really inviting. Can't blame you for liking it as much as you did. I really recommend this one Margot - it's not the kind of book I necessarily go for, but this one really transcends genres. Sounds a little bit more serious than the first two of his I've read. I'll be keen to see how you go with his earlier work - which one was it? WHIPLASH RIVER is the one I just read on holiday. GUTSHOT STRAIGHT was the one I read a year or two ago. Gutshot Straight is the one I've got, which I think might be his first? Really glad I've discovered him, thanks! So glad you liked this book. I did, too, which is why I recommended it to Bernadette for her U.S. reading challenge. I didn't know Berney wrote other books, but will look them up. But, oy, how my TBR list just mushrooms out of control all of the time. Yes, it's a great feeling isn't it, and well-deserved for you in this case. Yes definitely one of my books of the year so far. I don't; it seems like it would be the opposite of schadenfreude - feeling joy at someone else's enjoyment. But nope, can't find such a word in German. Lots of great words for every type of bad feeling for every reason. But not so much for good feelings felt due to sharing anything, not just books. Mutgefuhl which means compassion is the closest to good feelings for others. Maybe an expert in German could weigh in on this. Google doesn't know. Moira, I'm sold on the author's work. I will try and get this or one of two Col mentioned in his comment. You should Prashant - honestly, such a good writer. I actually bought this in the last couple of weeks, based on Bernadette's review and other recommendations. I probably won't read it for a few months, have too many other books planned. But it is good to know I have a good contemporary book in my future. Berandette and Col are both right! This is certainly one of the best contemporary books I've read this year. I think you will like it.